My Baby Gifts has prided itself in the development of quality newborn baby gifts and hampers for over 12 years now. We work closely with our brands to source only the finest baby gifts & hampers. Our innovative development team work closely with the managers to ensure you receive only the highest quality apparel. All our gifts are presented in a creative and unique manner for all to admire. This is a key philosophy at My Baby Gifts and will continue to be the foundation to our success. Be sure to keep an eye out for our new baby gifts which is updated regularly with new season designs. Our baby gift hampers use local Australian brands that have undergone rigorous testing to meet strict Australian standards & guidelines. It's important for safety and peace of mind that the gift you are sending someone has the correct labelling and has been tested to meet Australian standards. We are based in Melbourne, Victoria which allows us to offer same day delivery to Melbourne Metropolitan areas and most hospitals with a maternity unit in Melbourne. Same day delivery is provided by courier to ensure your newborn baby gift is delivered on time, while the mother is still in the hospital maternity ward. Please note that couriers and mail delivery systems are different networks & My Baby Gifts uses courier networks to deliver baby hampers to Melbourne hospitals because the driver will deliver directly to the ward - mail delivery does not. Our business model ensures that we dispatch all orders received by 1pm on that day. This helps get your baby gift delivered to Sydney, Adelaide, Hobart or Canberra asap. We offer express delivery to all major capital cities which ensures your gift arrives next day when orders are placed by 1pm. We understand this is a special time not only for the family but also close friends and work colleagues so it's paramount that gifts are sent out as early as possible to ensure timely arrival. Finding the right baby gift can be time consuming, tedious and sometimes leave you with more questions about what to send. My Baby Gifts has been preparing and delivering baby gifts for 12 years now and we have mastered the art of baby gift giving. We can deliver to local hospitals in Melbourne same day, with some locations having free delivery. Whether you choose to send to the home or a business address is totally up to you. If an office staff member has given word of her impending birth, her office friends normally deliver a baby hamper to the place of work, otherwise you can wait for the baby and send the gift to her home or the hospital. Our passionate team aim to provide the best and most unique baby gifts on the marketplace. We love to put ourselves in your shoes and feel pleased to give such stunning baby gifts that are second to none. Exceptional gift presentation is one of the most important aspects when one gives a gift and has always been our core focus. Our yearly visits to trade show events both locally and abroad ensures we are up to date with the latest seasons and newest stock from our suppliers. It's also a chance for us to source new suppliers. Some new gift wrapping styles we are toying with. Adorable new baby girl gift hamper with only the finest items from local Australian brands. This lovely sailor themed baby gift hamper by @emotionandkids is going to a new home today. Lovely new addition to our range. Includes beautiful items from Living Textiles, Marquise and Star and Rose. Stunning new addition to our 2019 range. 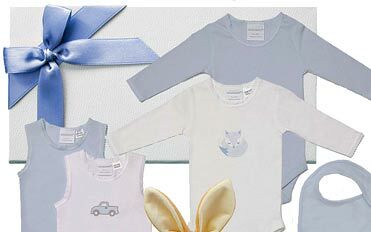 Shop for exclusive baby gifts delivered Australia wide. A gorgeous new addition to our knitted plush range of baby gifts. This fabulous hamper has a great range of unique toys and accessories for new baby and mum to enjoy. Lovely new addition to our new baby hamper range. We have some gorgeous items to showcase in this hamper.